I was shocked to learn that Lazy Day Café (2020 E. 3300 South, Ste. 23, 801-953-0311) opened as recently as 2010. 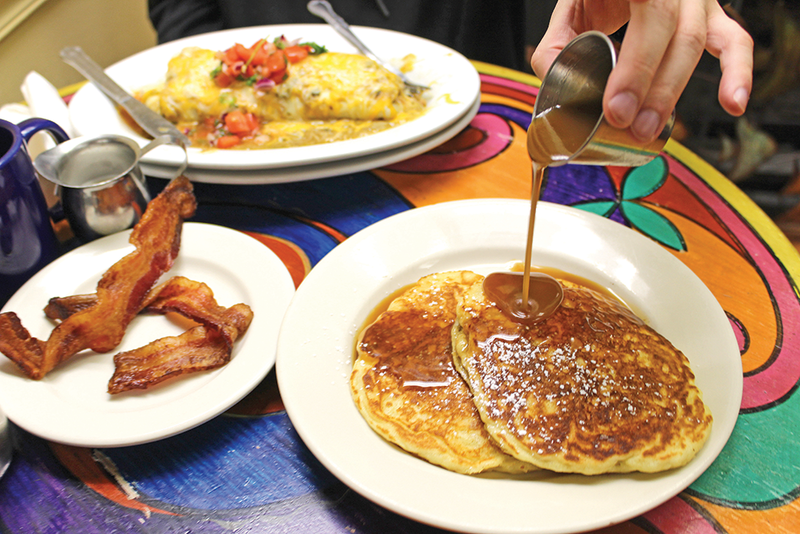 Although it doesn't yet have a decade under its belt, the place feels like it has been cooking up creative takes on breakfast and Southern comfort food in the heart of Millcreek for generations. While it might still be young in restaurant years, I fully expect to be one of those diners who takes their grand-kids here for a big plate of lemon pancakes once I reach that age—if the planet can survive the pack of nut jobs currently at the wheel, that is. For the moment, however, we're all still breathing. At the very least, it means we can still enjoy good food with one another, which is why Lazy Day Café is worth a visit. It's replete with authentic diner vibes: Line cooks chat politely with customers as they whip up bacon and eggs, art born of kitschy idioms dominates the wall space, and breakfast—hallowed be its name—is available all day. While the old-school foundation is here in spades, Lazy Day spikes its aesthetic with just enough new-school pop to attract the fresh-faced, post-hipster Millennials I've been reading about (you know, the ones who killed Hooters). I was first lured here when I heard about their famous lemon pancakes ($7.50). By that point in my life, I had consumed pancakes incorporated with all kinds of fruit, but lemon was not on the list. As an obsessive completionist when it comes to breakfast food, I zipped over with my wife for a quick Saturday brunch to see what all the fuss was about. For starters, Lazy Day opts for pancakes with more of a rise, creating a velutinous texture that's a feathery dream. The lemon flavor haunts the porous corridors within, softly kissing your palate with just enough flirtatious energy to keep you diving back into your short stack. In fact, the flavor is so delightfully subtle, I recommend using the housemade buttermilk syrup sparingly. This luxurious mixture is essentially brown butter and caramel, a decadence that tends to overwhelm the understated citrusy taste. To hell with lemonade, I say! When life gives you lemons, make pancakes. While it's hard for me to visit Lazy Day and order something other than these remarkable flapjacks, I'm glad I hopped over to the savory side with the shrimp and grits ($10). It's a Southern staple that's tricky to get in these parts, and Lazy Day's interpretation of this classic suggests an artist in the kitchen. On paper, shrimp and grits is just that—a dollop of corn grits, melted cheddar cheese and a pile of sautéed shrimp. All of the above were indeed present on my plate, but it also came with a helping of crispy bacon, tomatoes and green onion. It didn't hurt that the entire dish appeared to be swimming in bacon grease, but there was something about the flavor combination created by the party on my plate that struck a flavor balance uncharacteristic of breakfast food. Crisp bacon paired with the velvety grits and the acid of the cherry tomatoes enhanced the flavor of the shrimp. Did I mention that the whole thing was drenched in bacon fat? Because the whole thing was drenched in bacon fat. Any place that serves breakfast all day intends to specialize in that meal, but I was also curious about Lazy Day's lunch menu. I went with the garlic burger ($9) because having a garlic burger on your menu in this town is like throwing down a gauntlet. In Utah's burger hierarchy, the garlic variety comes second only to the pastrami burger, so unleashing your own iteration to the masses is a ballsy move. While Lazy Day's burger is indeed a stalwart example—it's got a great, juicy patty served on a challah-like bun—its garlic flavor is a bit too muted to be a real contender for the garlic burger hall of fame. At its core, Lazy Day Café is a breakfast and brunch joint, and they know exactly what they're doing. The wait staff works hard to create a friendly, neighborhood diner atmosphere, while the kitchen staff whips up some truly amazing flavor combinations disguised as simple comfort food. Next time you're in Millcreek and in need of some flavorful, higher-end comfort eats, head down Lazy Day's way. Open: Seven days a week, 8 a.m.-2 p.m.